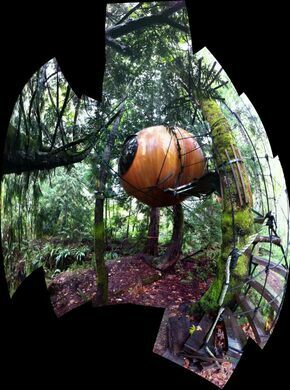 Somewhere in the middle of the forest on Vancouver Island, you’ll find large wooden orbs suspended from the trees. 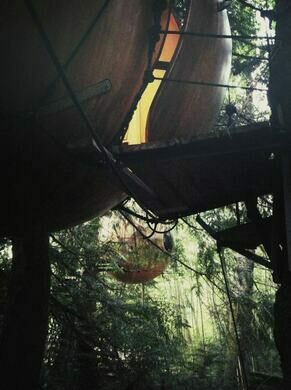 Take the spiral staircase and short suspension bridge leading up to them and enter into the sphere to experience nature from a different perspective. Designed to look vaguely like enormous nuts or seeds, the cedar and spruce spheres borrow from and collaborate with the surrounding environment. The suspension mimics spider webs by attaching to several different strong points among the trees. 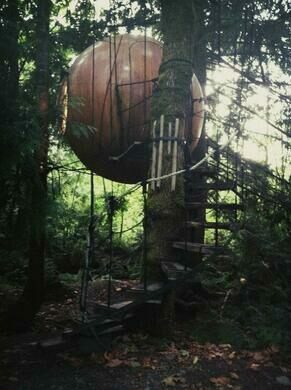 The spheres are made of fiberglass and wood and borrow heavily from sailboat and construction methods. Inside the curving walls complete with portholes for windows, space is maximized with fold-out tables and mirrors, curved loft beds and benches, and tiny appliances. 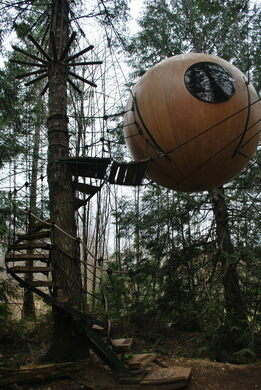 Touted as “the ultimate tree-house experience,” these free spirit spheres can be rented overnight. If you just want to see them, book an appointment as they are on private property.